This farmer in his dress-coat, high collar and good shoes maybe on his way to pay a visit to his neighbor on Sunday. He uses his heavy horse, which probably is used for harness work during the week. He does not bother about a saddle, a very simple bridle is enough to feel comfortable with his horse. This is a good example of the close bond between rider and horse during work and during free time. The horse is completely relaxed, even with the weight of this rider, and just waits until it is expected to move on. The rider sits proudly and relies on his mount. Farming scenes are often idealized, but this one is realistic and typical for its time. 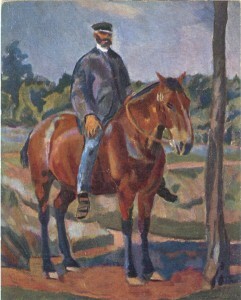 The painter died young in the first world war, as his contemporaries August Macke and Franz Marc, who both used the horse as an essential part in their paintings. The three greys are Orlov trotters, the breed created by Count Orlov for trotting races and coaching by the end of the 18th century. This painting was part of the Russian exhibit at the World Exposition in London in 1910, so it was considered to represent an excellent example of Russian art and life. It received a first prize. The troika harness is most interesting. The middle horse runs between shafts and on the end of the shafts a bow (djuga) has been mounted. A check rein of the middle horse is fixed to the djuga to keep its head up. This horse pulls the carriage with the thin collar. The outer two horses run between traces and pull the carriage with a breast band. All three horses wear a small collar with jingle bells just behind their ears. The driver has the reins of the middle horse in each hand, together with the single rein of both outer horses. This single rein runs on the outer side of the horse only. That is the reason why in a troika harness the outer horses always run with their head bent outward. Here the middle horse is in a very fast trot, while the outer horses are gallopping, as usually in a troika. With the single rein they are difficult to control and the driver only can slow them down by pulling their head outward, as we see here. 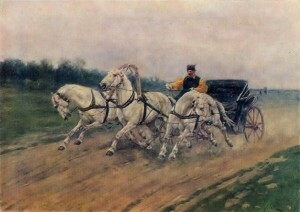 The carriage is a victoria, not designed for a trotting race, but used nevertheless for this high speed ride on a dirt road.